Egyptian air strikes targeted locations of the Shura Council of Mujahideen in the Libyan city of Derna, Al Arabiya sources reported. 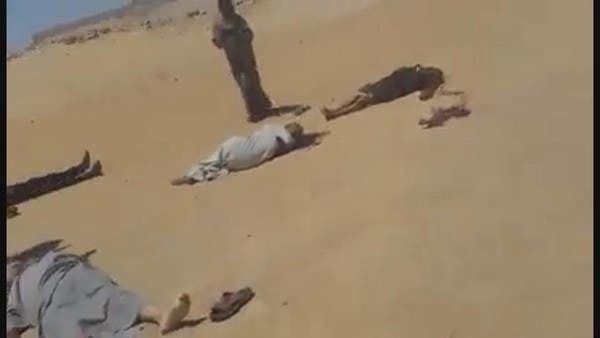 Casualties were reported among militants after Egyptian airstrikes hit extremists’ locations in Derna, Libya. This followed the televised address by Egyptian President Abdel-Fattah al-Sisi on Friday said that Cairo will not “hesitate” to strike “terrorism” anywhere whether it is inside or outside his country after masked gunmen killed 29 Coptic Christians, mostly children. 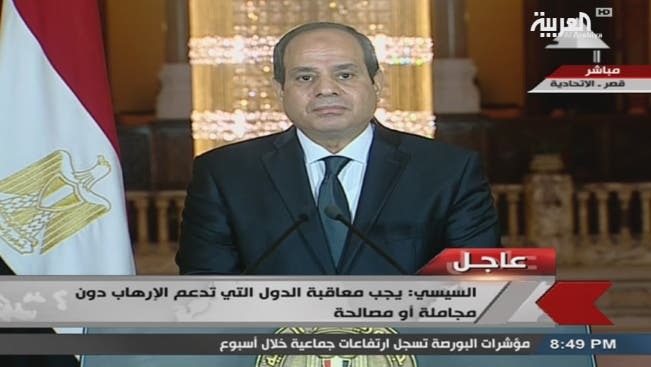 “Egypt will not hesitate at all to strike terrorist camps anywhere,” Sisi said during the TV address, adding that Cairo does not “conspire” against any country, and is keen to full protect its national security. Sisi did not specify any country, however, he said since the fall of the Libyan regime in 2011, Egypt was watching its borders carefully. He also urged US President Donald Trump to “prioritize” crushing terrorism. “If Egypt fall so the rest of the world,” he warned. The Egyptian president said the country’s forces have destroyed 300 vehicles being used by “terrorist” elements in the past three months only near the western Libya border. He further warned “what happened today, will not pass like that” without punishment. 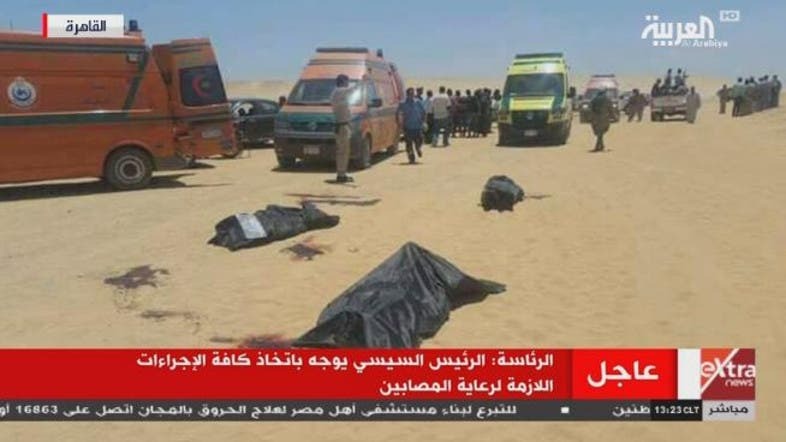 Masked gunmen, who used machine guns, opened fire at a bus carrying Egyptian Coptic Christians to a monastery south of Cairo on Friday, killing 28 mostly children and injuring 24 others, Al Arabiya News Channel reported. A Church source told Egypt’s al-Ahram newspaper that the bus trip was for children to visit a monastery and only three has survived. Khaled Mujahed, the official spokesman for the Health Ministry, said 12 from the 24 wounded have left the Maghageh hospital after treatment, but one case of a child has been to Al-Minya University Hospital while 11 others to Nasser institute hospital. The Health Ministry also said that among those injured were two children aged two. The Christian group was travelling in two buses and a truck through the province, which is home to a sizeable Christian minority, the governor of Egypt’s Minya province, Essam al-Bedaiwy, said. The health ministry said there were between eight and 10 attackers dressed in military uniforms, according to witnesses. Meanwhile, Egyptian sources told Al Arabiya News Channel that there were 10 to 12 gunmen. Al Arabiya News Channel’s correspondent said the Interior Ministry’s Special Forces shut down entry points and exits to Minaya to prevent militants from escaping. Egypt’s Interior Ministry also said that the gunmen attacked one bus which was heading to Al-Anba Samuel monastery. No group immediately claimed responsibility for the attack, which came on the eve of the holy Muslim month of Ramadan. Meanwhile, Egypt’s Grant Mufti denounced the attack, saying the culprits have violated all of Islam’s principles. Egypt’s Prosecutor General has also ordered an immediate probe after the deadly attack. The UN Security Council, Arab League, Saudi Arabia, the UAE, Jordan, Kuwait and the UK have all condemned the attack. I despise & condemn the killing in Minya. May the terrorists fail in spreading hate. Strength & solidarity to all suffering & responding. After the deadly attack, Egyptian President Abdel-Fattah al-Sisi called for an emergency security meeting. Coptic Christians, who make up about 10 percent of Egypt’s population of 92 million, have been the subject of a series of deadly attacks in recent months. About 70 have been killed in bomb attacks on churches in the cities of Cairo, Alexandria and Tanta since December. Those attacks were claimed by ISIS. Families of the victims at Maghagheh hospital. During the trip, Francis paid tribute to the victims of the December bombing at Cairo’s St. Peter’s church, which is located in close proximity to the St. Mark's cathedral, the seat of the Coptic Orthodox Church. Following the pope’s visit, ISIS affiliate in Egypt vowed to escalate attacks against Christians, urging Muslims to steer clear of Christian gatherings and western embassies as they are targets of their group’s militants. Copts rallied behind general-turned-president, Sisi, in 2013 when he ousted his Islamist predecessor Mohammed Mursi, who hails from the Muslim Brotherhood group. Attacks on Christian homes, businesses and churches subsequently surged, especially in the country’s south.